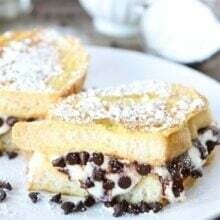 We recently made Peaches and Cream Stuffed French Toast for breakfast and I told Josh that someday this decadent French toast will be on our B&B menu. It is divine! Harry and David sent us a box of beautiful Sweet Oregold Peaches that were the star of the Peaches and Cream Stuffed French Toast. Their peaches are amazing! We snacked on a few fresh peaches before making our French toast and the room was silent. They were so good we didn’t need to say anything. 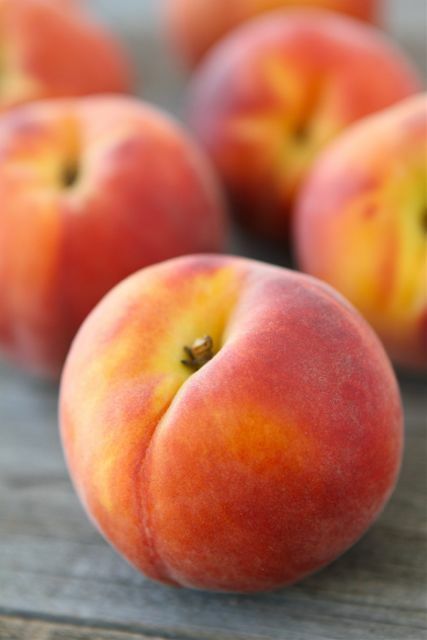 We just savored our juicy peaches. Later on, we diced up some peaches for Caleb and he also enjoyed them, except he wasn’t quiet. He yelled and begged for more! I am glad his palate is already refined. To make the French toast, we made a cream cheese filling that was sweetened with powdered sugar, cinnamon, and vanilla extract. We spread the cream cheese filling on two slices of French bread and layered the peaches on top. We created a sandwich by adding another slice of bread. We dipped the sandwiches into an egg mixture and cooked the French toast until golden brown. We served the stuffed French toast with diced peaches and pure maple syrup. The creamy filling and sweet peaches were a match made in heaven. I couldn’t of imagined a better French toast. Someday, when we have our B&B, I hope you will join us for Peaches and Cream Stuffed French Toast. Until then, please promise me you will make this French toast at home! 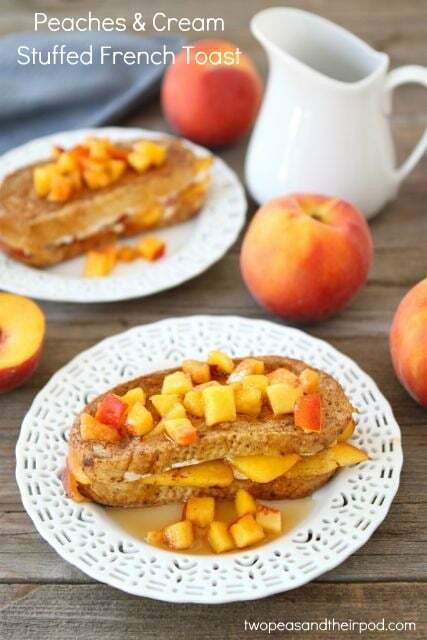 French toast stuffed with a sweet cinnamon cream cheese filling and peach slices. Top with diced peaches and maple syrup for a decadent breakfast treat. To make the filling, in a small bowl, mix cream cheese, powdered sugar, cinnamon and vanilla extract, until smooth. 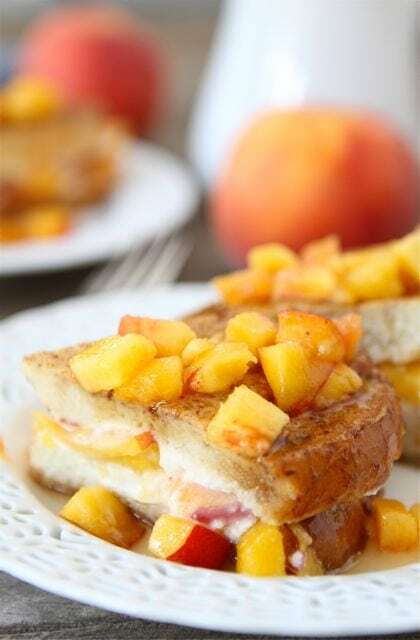 Spread cream cheese filling on slices of bread; top with peach slices. Make two French toast "sandwiches." In shallow pan or pie plate, beat eggs, milk, vanilla, and cinnamon. Dip the sandwiches in the egg mixture, on each side. Heat a large skillet or griddle to medium-high heat. Cook French toast sandwiches, on both sides, until golden brown, about 4-5 minutes each side. Serve warm with diced peaches and maple syrup. Perfect looking peaches & toast! I just baked with peaches and nectarines today; love them so much, too! This sounds amazing Maria & what an awesome way to use peaches! Love love LOVE the idea of peaches and cream french toast! DELISH! I love it! Made stuffed french toast like yours with strawberries and I just love it!!!! Your french toast looks just amazing!! I’m in GA right now, and just like you would think, the peaches my mom has are delicious. My 2-yr old loves to just gnaw at them! This looks like a fabulous combination! Wowwwww! Sounds too great!!!!! Fantastic. oh my word, that looks so good, for any meal! Oh my goodness – that looks like some seriously delicious French Toast. I’d visit your B&B! If you are making this, I’ll be first in line at your B&B! You should own a B&B, I’d totally stay there! Especially if you made this french toast every morning! I think B&B’s are the coolest things ever and there’s a shortage of them with really great food. You could own the market, missy! 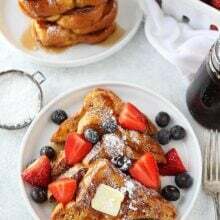 🙂 Your french toast looks fresh and tasty! One of my all time FAVORITE french toast flavor combos 🙂 Love peach + cream cheese! 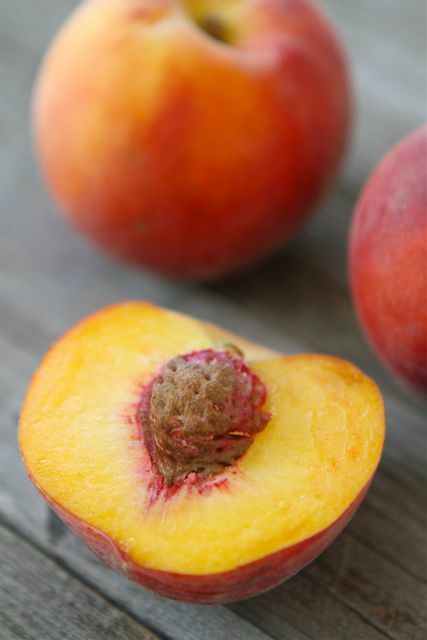 Not only is french toast my favorite brunch/breakfast food but peaches are one of my favorite fruits! Stuffed french toast?? YES. And peaches are now in season here. Win! Oh I need to get some peaches! I love when they are in season and this looks so great. Living in the wine country, we are surrounded by B&B’s and their guests visit our wine tasting room daily. I always ask them what they had for breakfast…I can’t help it. However, owning a B&B is tough and competitive work, but, I will tell you this, all the owners read food blogs looking for seasonal, breakfast inspiration!! I will be sure to pass this beautiful recipe along to many of my B&B friends, they will truly appreciate it! Wish I had peaches so I could make these this morning. If you open a B&B, I’m coming to stay and ordering this for breakfast. It looks absolutely divine. Lovin’ peaches right now! my hubby will FLIP! this sounds like the best french toast ever! What a gorgeous breakfast plate. Your B&B sign is sure to always read “no vacancy”! I love peaches SO much! This looks like a perfect breakfast! I’ve never bought fruit online before, too impatient I guess. How has your experience been? Fantastic way to use up those peaches! I can relate to your dream too, my wife and I would love to open our own B and B when the kids are older and college bound..my destination, Napa or the central California coast! Your pictures are amazing!… I want this for my breakfast! Thanks for the fabulous recipe. I have dreamed of a B&B as well, alas my husband doesn’t share that dream. S0, we will just be staying at these adorable, hospitable little Inns. When you open we will totally stay at your Bed & Breakfast! P.S Love peaches and cream. What an amazing french toast. Perfect use for fresh peaches! 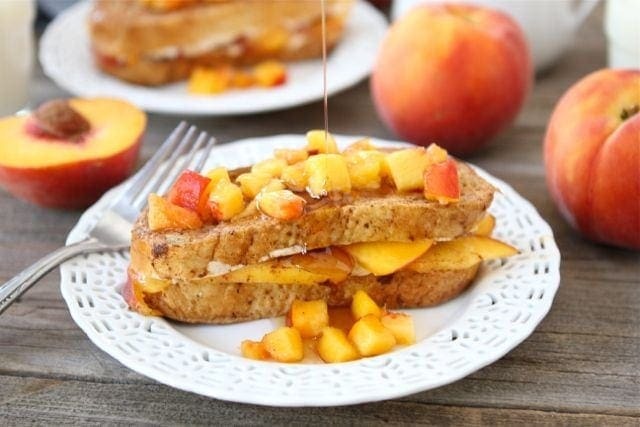 I love stuffed french toast and with fresh peaches?! Amazing! I love stuffed french toast. This looks ah-mazing! You can count on me joining you for breakfast. That will be the BEST B&B ever. I adore peaches and french toast, the perfect breakfast combination for me! ooh, now that’s a breakfast i’d love to wake up to 🙂 …or get up to make myself, haha! I am definitely coming to your B & B!!! Holy cow they look scrumptious! Love this! Those peaches are gorgeous and who wouldn’t love peaches and cream? The peaches are soooo good this year! Love your french toast. I posted french toast today too…..great minds! This is DEFINITELY a B&B worthy breakfast! So luscious and yet full of fresh flavors! I really need to comment earlier, but this does look truly decadent. I love it! So perfect for a B&B!! I would come!!! I have a dream to open a bed and breakfast too! That looks AMAZINGLY fresh! I love the idea of that! Never even crossed my mind. This looks so wonderful Maria- great breakfast recipe! Sounds delicious! Anything with cream cheese and peaches and I’m sold. I’d love to have you link this up to Titus 2 Tuesday on Cornerstone Confessions. Hope to see you there. Looks pretty tasty! Gotta go out and get me some market-fresh peaches! I love making special breakfasts when I have guests over too. I will keep this recipe in mind, it looks fantastic! This was amazing! Made it for breakfast this morning with a loaf of brioche. My husband and daughter will do anything I ask them to do today after this 🙂 Thanks! This dish is all the great flavors of summer. So fresh and colorful! Gorgeous! I made a puffy peach omelet once and that was fabulous, so I’m sure this must be amazing! I’m drooling looking at these beautiful pictures. Wish I had this for breakfast today! My husband made this for us for brunch today and it was sooooo delicious!! 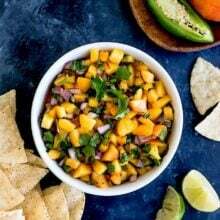 This looks so good, I can’t wait to try it in our B&B in Oskaloosa, Iowa, but alas it will be a while before we see peaches that are good and fresh to make it best. I may try it with the bottled peaches just because I can’t wait to try it. I was just wondering how large the French bread was.4 eggs seems like a lot for 2 servings. Are you using baguette? I lightly toasted the bread before adding the cream cheese mix. It added a bit more of a light crunch to it. Oh my goodness!!! This is delish!! I made with French brioche bread, omitted the powdered sugar and used a drizzle of maple syrup instead, and used whipped cream cheese. This will go on our regular rotation, has quickly become a family favorite!! Thank you for sharing! !